A continuous wave or continuous waveform (CW) is an electromagnetic wave of constant amplitude and frequency; a sine wave. In mathematical analysis, it is considered to be of infinite duration. Continuous wave is also the name given to an early method of radio transmission, in which a sinusoidal carrier wave is switched on and off. Information is carried in the varying duration of the on and off periods of the signal, for example by Morse code in early radio. In early wireless telegraphy radio transmission, CW waves were also known as "undamped waves", to distinguish this method from damped wave transmission as effected by early spark gap style transmitters. 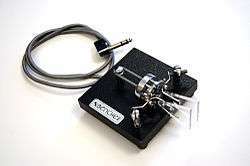 Very early radio transmitters used a spark gap to produce radio-frequency oscillations in the transmitting antenna. The signals produced by these spark-gap transmitters consisted of strings of brief pulses of sinusoidal radio frequency oscillations which died out rapidly to zero, called damped waves. The disadvantage of damped waves was that their energy was spread over an extremely wide band of frequencies; they had wide bandwidth. As a result they produced electromagnetic interference (RFI) that spread over the transmissions of stations at other frequencies. It was realized that the ideal radio wave for radiotelegraphic communication would be a sine wave with zero damping, a continuous wave. An unbroken continuous sine wave theoretically has no bandwidth; all its energy is concentrated at a single frequency, so it doesn't interfere with transmissions on other frequencies. Continuous waves could not be produced with an electric spark, but were achieved with the vacuum tube electronic oscillator, invented around 1913 by Edwin Armstrong and Alexander Meissner. In order to transmit information, the continuous wave must be turned off and on with a telegraph key to produce the different length pulses, "dots" and "dashes", that spell out text messages in Morse code, so a "continuous wave" radiotelegraphy signal consists of pulses of sine waves with a constant amplitude interspersed with gaps of no signal. Damped wave spark transmitters were replaced by continuous wave vacuum tube transmitters around 1920, and damped wave transmissions were finally outlawed in 1934. In on-off carrier keying, if the carrier wave is turned on or off abruptly, communications theory can show that the bandwidth will be large; if the carrier turns on and off more gradually, the bandwidth will be smaller. The bandwidth of an on-off keyed signal is related to the data transmission rate as: where is the necessary bandwidth in hertz, is the keying rate in signal changes per second (baud rate), and is a constant related to the expected radio propagation conditions; K=1 is difficult for a human ear to decode, K=3 or K=5 is used when fading or multipath propagation is expected. What is transmitted in the extra bandwidth used by a transmitter that turns on/off more abruptly is known as key clicks. Certain types of power amplifiers used in transmission may increase the effect of key clicks. The first transmitters capable of producing continuous wave, the Alexanderson alternator and vacuum tube oscillators, became widely available after World War I. Early radio transmitters could not be modulated to transmit speech, and so CW radio telegraphy was the only form of communication available. CW still remains a viable form of radio communication, many years after voice transmission was perfected, because simple transmitters could be used, and because its signals are the form of modulation best able to penetrate interference. The low bandwidth of the code signal, due in part to low information transmission rate, allowed very selective filters to be used in the receiver which blocked out much of the atmospheric noise that would otherwise reduce the intelligibility of the signal. In military communications and amateur radio, the terms "CW" and "Morse code" are often used interchangeably, despite the distinctions between the two. Morse code may be sent using direct current in wires, sound, or light, for example. A carrier wave is keyed on and off to represent the dots and dashes of the code elements. The carrier's amplitude and frequency remains constant during each code element. At the receiver, the received signal is mixed with a heterodyne signal from a BFO (beat frequency oscillator) to change the radio frequency impulses to sound. Though most commercial traffic has now ceased operation using Morse it is still popular with amateur radio operators. Non-directional beacons used in air navigation use Morse to transmit their identifier. A continuous-wave radar system is one where a continuous wave is transmitted by one aerial while a second aerial receives the reflected radio energy.